AIM: Laparoscopic cholecystectomy is increasingly being offered on index emergency admission. This study assessed whether the surgeon specialist interest influences the patient outcome following emergent laparoscopic cholecystectomy. METHODS: The study included all patients who underwent emergency cholecystectomy after an index emergency admission over an 18-month period. End-points studied were conversion rate, post-operative complications, time delay to surgery, the reasons for open conversion and mortality. RESULTS: The study included a consecutive series of 113 patients (31 men (27%) and 82 women (73%). The mean age of all patients was 47.1 years (range 16-84). Indications for surgery were acute cholecystitis (46%), recurrent biliary colic (34%) and gallstone pancreatitis (20%). 67% underwent surgery under the upper GI cohort with the remaining 33% performed by the non-upper GI cohort. 12 patients required conversion to open surgery. 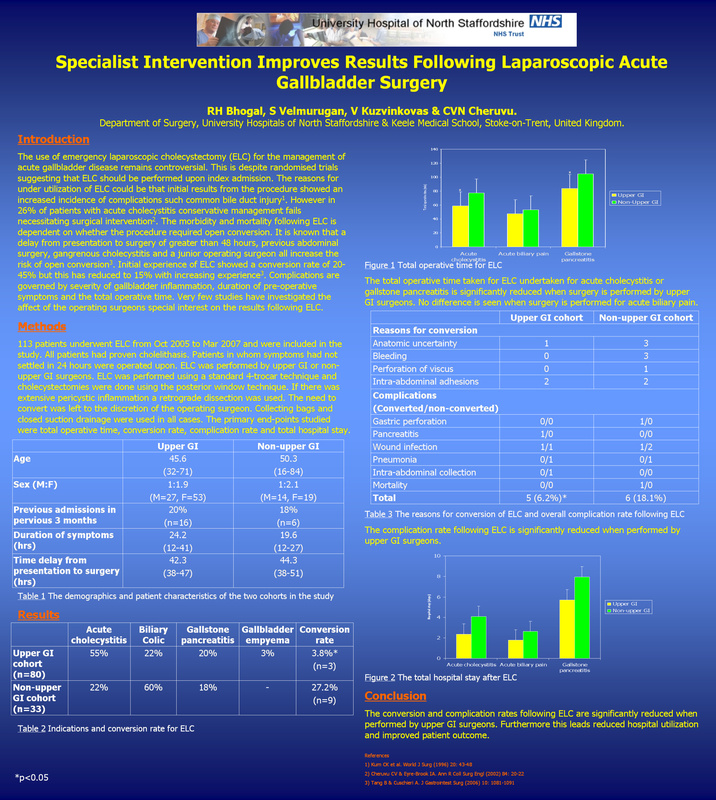 The upper GI surgeon conversion rate was 3.8% *compared with 25.7% in non-upper GI surgeons. The reasons for conversion included intra-abdominal adhesions, bleeding from the gallbladder bed, equivocal anatomy, perforation of the gallbladder with stone spillage and gastric perforation. One patient in the non-upper GI cohort who underwent open cholecystectomy died 16 days post-operatively. Overall complication rate were 6%* in the upper GI group compared to a 17% in the non-upper GI group. CONCLUSION: Our study highlights that the risks of open conversion of laparoscopic cholecystectomy is decreased when the procedure is carried out by upper GI surgeons. This leads to a decreased operative time and reduction in the complication rates.